On Monday, January 21st, 2019 the Nova Scotia Government & General Employees Union (NSGEU) and the Nova Scotia College of Social Workers (NSCSW) launched a campaign encouraging Nova Scotians to write to the Premier to demand an increase in spending on social programs including Child Welfare in the next provincial budget. 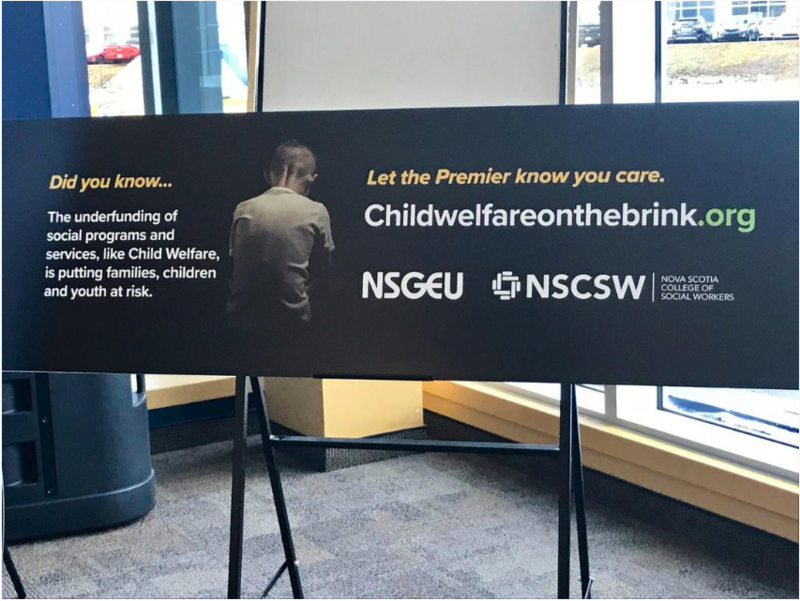 The campaign #childwelfareonthebrink feature adds on the sides of buses in both the Halifax Regional Municipality and the Cape Breton Regional Municipality as well as social media adds. The adds aim to draw folks into a website childwelfareonthebrink.org and asks them to share campiagn messages through there social media feeds and send an email to the Premier. This campaign is part of a larger Child Welfare Advocacy Strategy and part of the NSCSW’s strategic goals to become a recognized leader in advocacy and social justice working to protect Nova Scotians. The goal of the Child Welfare Advocacy Strategy is too mobilize community voices in order to raise the political and public discourse on the essential role of child protection in Nova Scotia in order to ensure that child welfare is a central platform issue in the next provincial election. We invite all who can, to join in this campaign as it is an issue that impacts us all. Rising inequality and the continued class divide between the rich and the poor which has allow the voices of oppressed to go unnoticed, eroded trust and increased anxiety and illness for all. The continued entrenchment of the patriarchy which has pitted rational thought against emotional thought and worked too devalue the work of professional care which is predominantly done by women. Shifted political discourse towards the language and assumptions of a free market economy. This trend has led governments to move more and more towards austerity policies which have worked to expand corporate influence and power, attempts to cut the cost of care, institutionalizes new management systems, and centralizes government services leading to highly top-down bureaucratic systems. Managerialism which devalues and deskills professional competence and creates a management framework which aims to run government services like a business searching for efficiencies rather than promoting human connection. We believe that in order to bring change to these systems we have to address it a social and political level and participate in a social movement towards broader change. A social movement approach challenges the premise that the current structures and bureaucracies-define the limits of our social reality. Social Movements are often paradoxical: They abandon the logic of current organizations in order to gather the power necessary to rewrite the logic of these organizations themselves. We believe that we have to see beyond economic measurements as a marker of the success of our society. We need to challenge this logic and work to build measurements that include the wellbeing of the entire population. Building a Social Policy Framework: The College’s social policy committee has worked hard over the past two years to draft a scoping statement on a Social Policy Framework. Social Policy Frameworks are tools that can guide decision making, set future direction, and identify important connections. Policy frameworks are blueprints for something we want to build or roadmaps for where we want to go. The vision of the NSCSW Social Policy Framework is to develop a roadmap for social policy that defines who we are as a profession and that reflects our aspirations for the province. A road map that offers Nova Scotians the opportunity to reach their potential and to benefit from social inclusion and the highest possible quality of life.We are delighted to be partnering with the Canadian Centre for Policy Alternatives to build this vision. Child Protection Advocacy: this project is underway with our ultimate goal being to make child protection a central platform issue in the next provincial election. The next steps in this project will be to host a symposium this spring in order to bring too together different stakeholders to flush out what the guiding principles for this system should be. This will then become the basis of our outreach to MLA’s and political parties. Mental Health Care Advocacy: The purpose of this project is to develop an advocacy paper and strategy to articulate the core values and principles that should frame and drive policy decisions to foster greater wellbeing and mental wellness. We are just in the final process of selecting a vendor. Nova Scotia Action Coalition for Community Wellbeing: We have been active in building a broader action coalition of community members dedicated to working strategically and collaboratively towards community wellbeing and a better quality of life for everyone. The Coalition exist to connect a community of action-oriented organizations and people who are committed to social inclusion and building a Nova Scotia where no one lives in poverty. If you are interested in getting involved in any of these initiatives there are a number of ways to so. Stay tuned for calls too action in this newsletter and on the College’s social media feeds. Where ever you can join in the actions. In the next few months, we will be putting out calls for both the social justice committee and social policy committee. Consider joining. In the next few months, we will be putting out a call for council elections. Council is the governing body the NSCSW and sets the tone in direction of our organization. We look forward to working with all towards a more socially just Nova Scotia.